The Show was held at Orkney Auction Mart on Sunday 12th August. The weather cleared up and a good crowd came to enjoy the display of old vehicles and artifacts. This year we focused on the centenary of the John Deere tractor. In addition we had a special place for the Land Rover introduced in 1948 and the Jaguar XJ series from 1968. 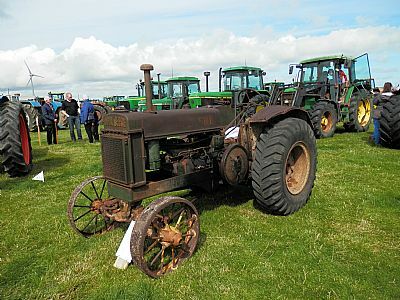 A great collection of John Deere tractors were on display the oldest being from 1938. Land Rover owners put on a show of all models from Series 1 to modern Freelander. A great example of our clubs purpose was represented by a Series 1 in the process of restoration. SSE and the TA exhibited some of their specialized Land Rovers. There were many cars, tractors, motorbikes and stationary engines on display and we were interested to see some beautifully modified and restored cars entered by young enthusiasts. The Orkney Motor Club took some of their cars including an unusual Honda sports car and a rare Reliant.